Chef Michael Chiarello, owner of Bottega Ristorante in Yountville, opened his Spanish style tapas restaurant called Coqueta along San Francisco’s Embarcadero last year. Since their opening, the restaurant has been extremely successful due to the delicious and fun tapas style menu and the amazing location along the water. Coqueta is divided into two parts: an outdoor patio area with a bar and an inside area as the main dining room. The restaurant offers a large menu with choices of cured meats and cheeses, bite-sized skewers, open faced sandwiches, cold/hot tapas, and entrées including rice dishes and items from the wood grill. 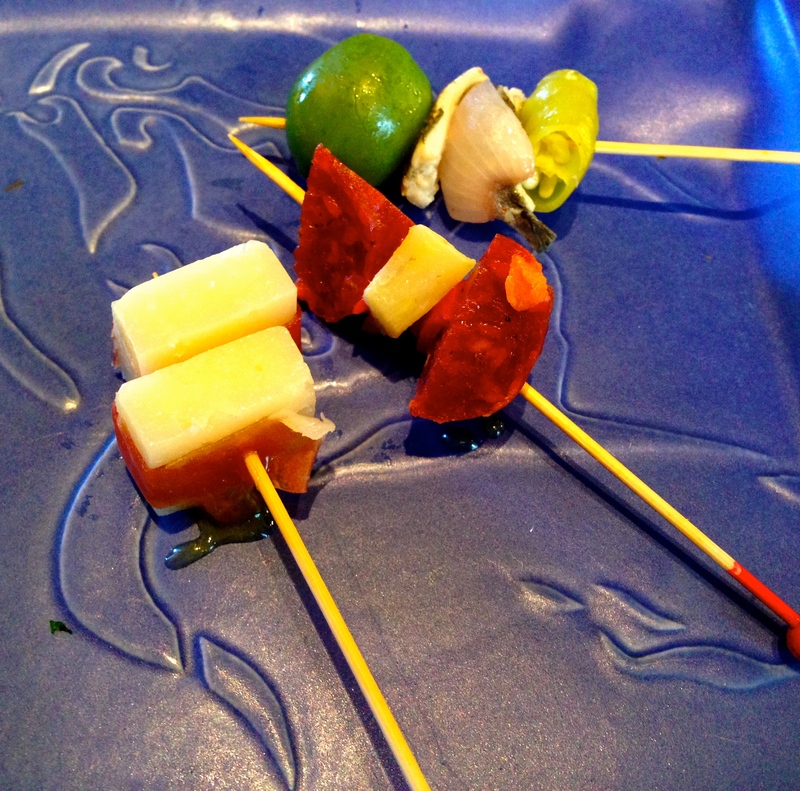 Bite-Sized Skewers: Jamón Serrano with Manchego Cheese and Apricot Preserves (7.5-8/10), Chorizo with Roasted Artichoke (7/10), and White Anchovy with Green Olive and Onion (7/10). 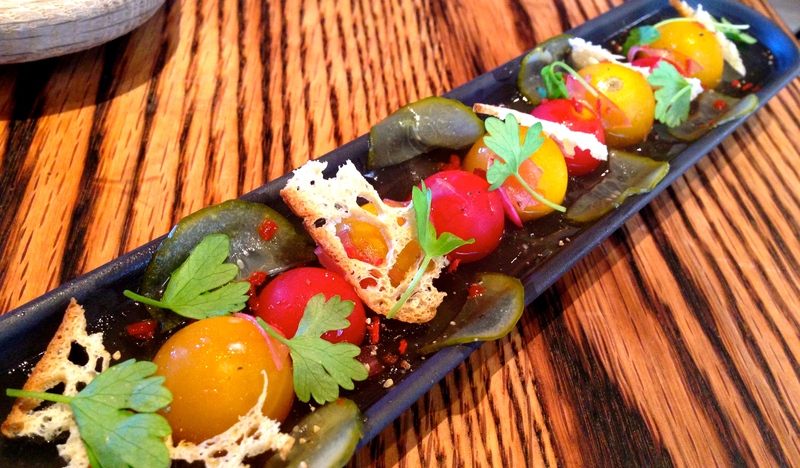 Cherry Tomatoes with a Gelée of Gazpacho Consommé, Persian Cucumber, and Crispy Garlic Chips (7.5/10). 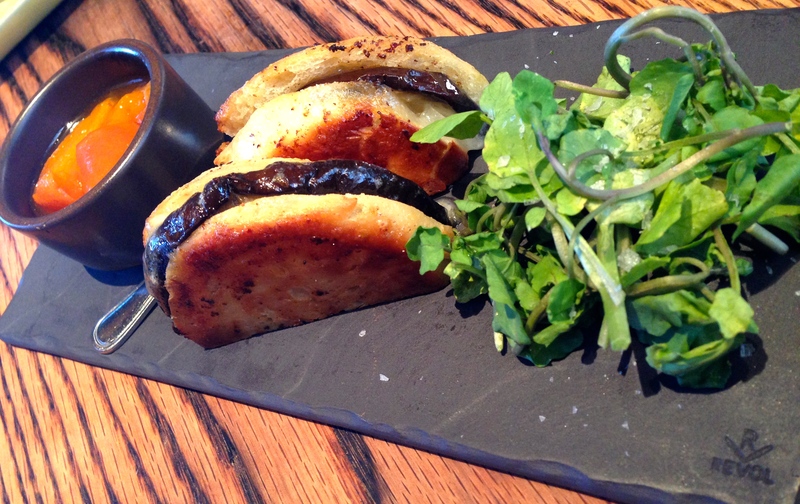 Brioche a la Plancha with Eggplant, Caña de Cabra Cheese, and Stone Fruit Preserves (8.5-9/10). 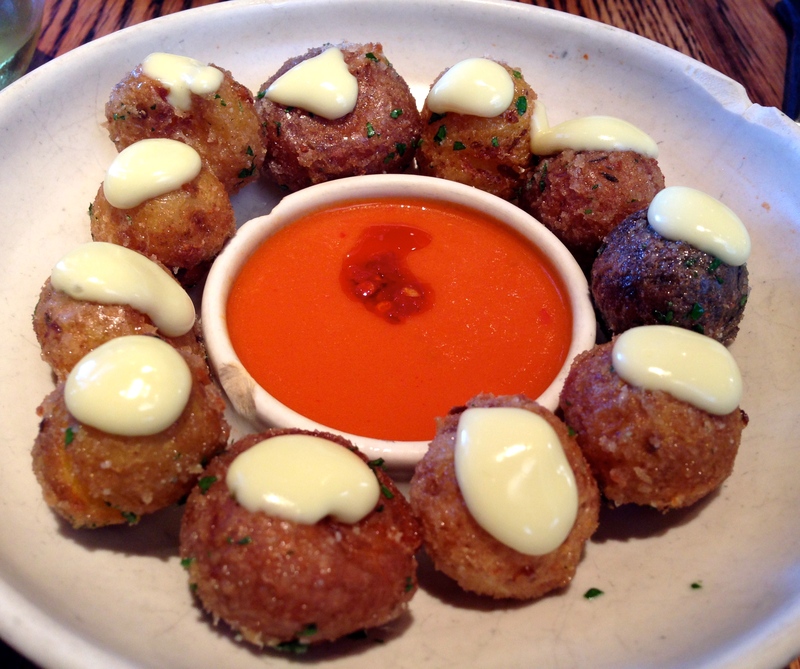 Lightly Smoked Patatas Bravas with Garlic Aioli (8/10). 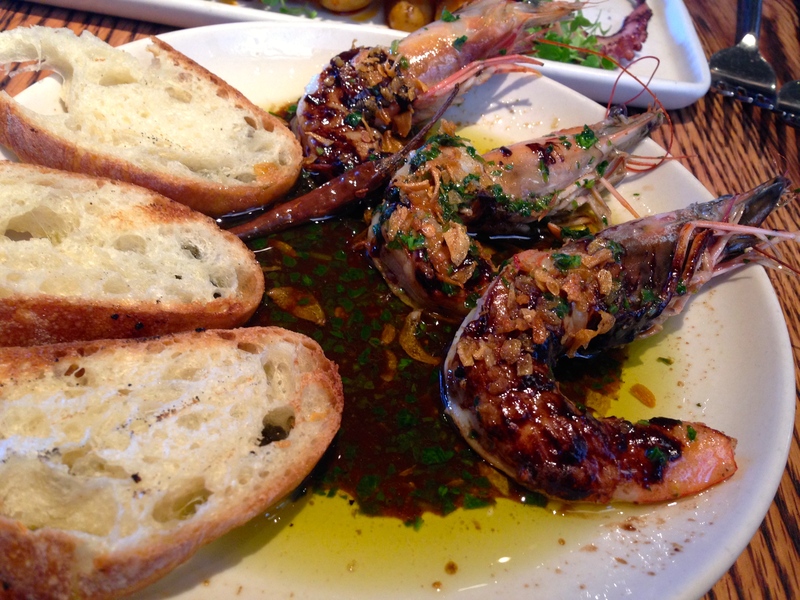 Olive Oil Poached Gulf Prawns with Black Garlic and Chili (7/10). 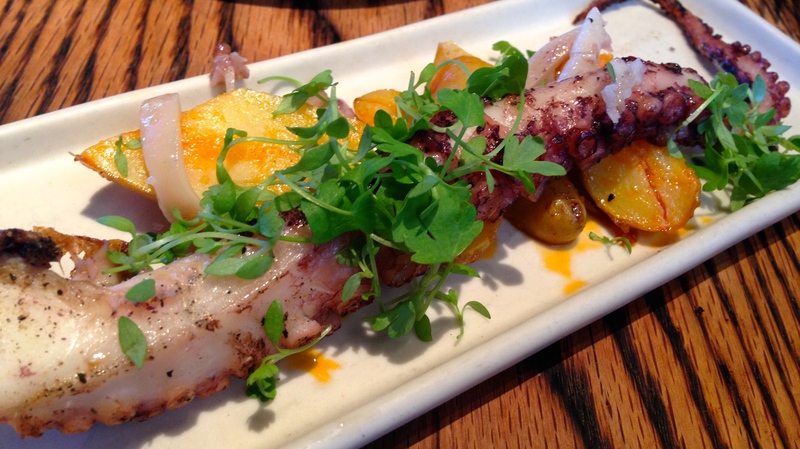 Grilled Octopus with Fingerling Potatoes and Pimentón Olive Oil (7.5/10). I love tapas style restaurants since the portions are smaller than portions from a traditional menu format and therefore you can try more dishes. My favorite dishes of the meal were the jamón ibérico de bellota, brioche with eggplant, and the patatas bravas. 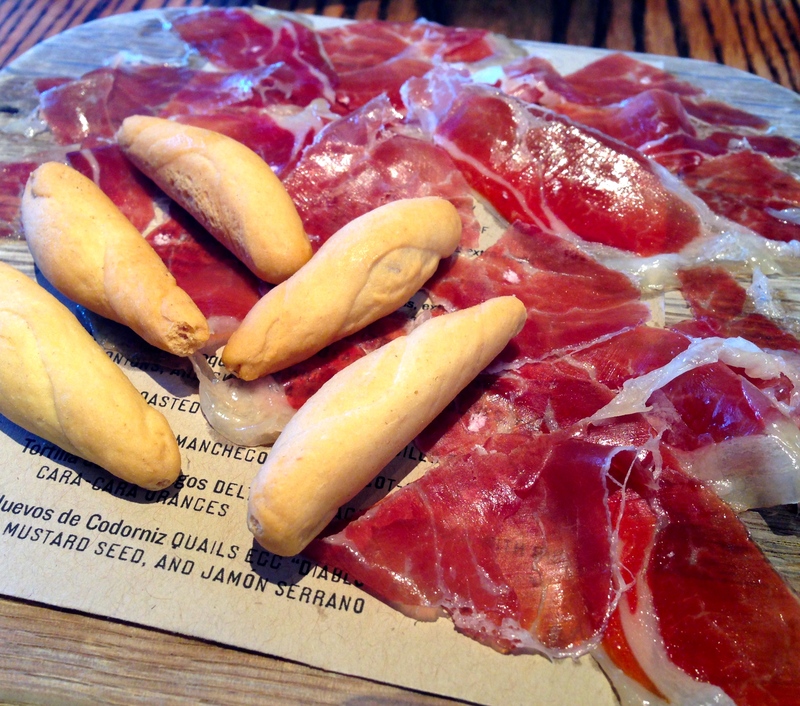 Now you can’t go wrong with jamón ibérico de bellota, the best cured ham ever. This ham comes from pigs that only graze on acorns which gives the meat a deep nutty flavor. Jamón ibérico has the perfect balance between sweetness, nuttiness, and saltiness with fat that literally melts in your mouth. The brioche a la plancha was probably my favorite dish of the night with a combination of unexpected flavors. Who would have thought that crunchy bread with creamy rich cheese and silky earthy eggplant paired with sweet stone fruit preserves would work? Well, it most definitely did! Lastly, you can’t go to a Spanish restaurant without ordering patatas bravas, fried potatoes served with spicy tomato sauce and luscious garlic aioli, yum! 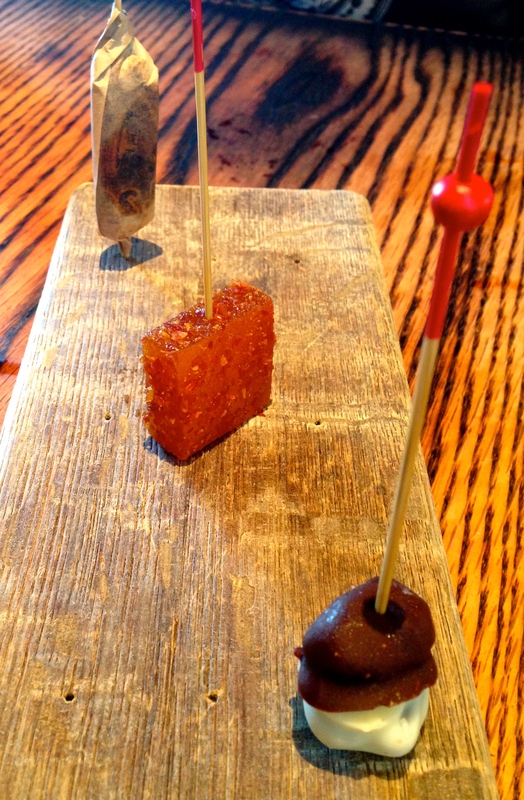 Coqueta serves tasty tapas taking inspiration from classic Spanish dishes with a Californian influence. I’d give Coqueta a rating of 7.5-8/10 for enjoyable food in a fantastic location. Pingback: Review: Aatxe. | Sale, Pepe, Amore.